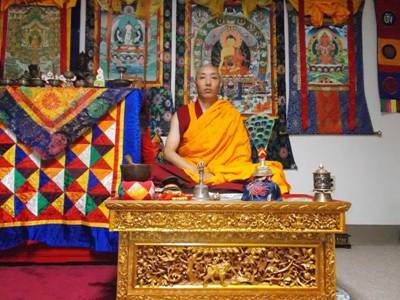 Khenpo Choephel is originally from Drigung Thil Monastery, the head-monastery of the Drikung Kagyu lineage. While at Drikung Thil, he received many teachings and instructions first from Pachung Rinpoche and later from Pachung Rinpoche’s successor, Gelong Rinpoche, Vajradhara Tenzin Nyima. Aside from having received extensive teachings in Mahamudra from these two great masters, he is also a master in the ritual-traditions of Drikung Thil Monastery and has also received training in debate and philosophy at Drepung Monastery in Tibet. Before he left Drikung Thil for Nepal, Khenpo Choephel served as the chant-master of the monastery. In 2007, he was appointed “Khenpo” by Drikung Thil Monastery. Khenpo Choephel has served as one of the three spiritual directors at Tibetan Meditation Center in Frederick, Maryland until 2011 and now is the Resident Lama and Spiritual Director of the Three Rivers Dharma Center in Pittsburgh, PA. Khenpo Choephel is giving a series of teachings and leading the retreats on the Fivefold Path of Mahamudra, which is the most important profound practice and essence of all the dharma of Buddhism.